Just a few molecules. A few strands of greatness left behind. That’s all I really want when I go into a place like Musso & Frank. It’s a fine restaurant on Hollywood Boulevard; it opened in 1919 and is one of Los Angeles’ oldest eateries. The food is great, the steaks legendary. But I wasn’t there for the food. I was there for the greatness. It’s a restaurant/ bar where people like F. Scott Fitzgerald proofread his novels, where Raymond Chandler wrote chapters of The Big Sleep, where Ernest Hemingway, Kurt Vonnegut, T.S. Eliot, Joseph Heller, John Steinbeck, Aldous Huxley all ate and drank. Surely they left something behind for people like me? I was there last week with some friends from high school. We found each other a year ago, 40 years after graduating from Blake School in Hopkins, Minnesota. One is a novelist who teaches writing, one is a successful screenwriter who now works in software, one is in the advertising business after working in newspapers. We had lots to talk about last week. Our high school has produced some pretty good writers who walked the same halls we did – Robert Pirsig who wrote Zen and the Art of Motorcycle Maintenance, and Al Franken who wrote comedy and now legislation. 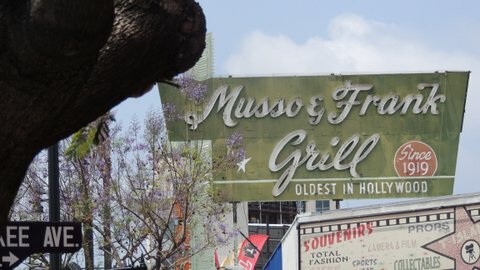 At Musso and Frank we caught up on each others’ lives, but the conversation kept turning back to great writers. It had to, in a place like that. 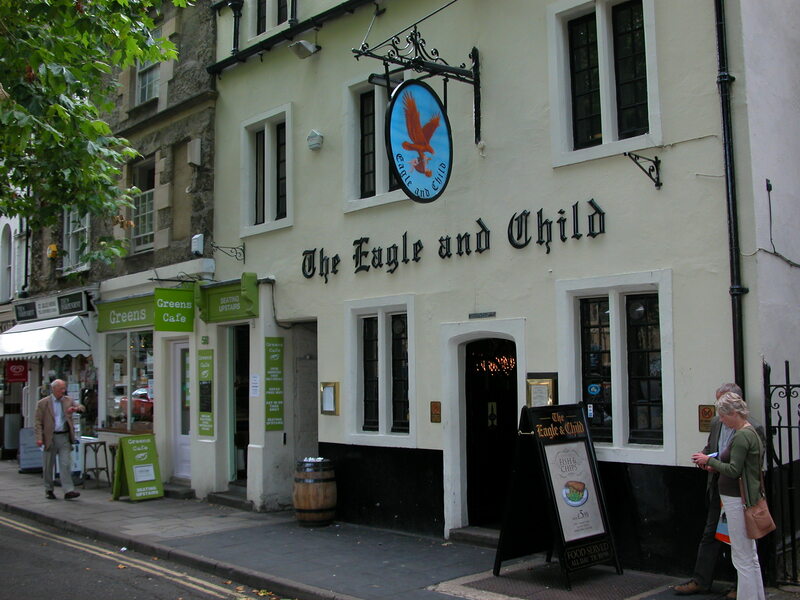 It reminded me of going to Oxford a couple of years ago and having lunch in the Eagle and Child, a pub where C.S. Lewis and J.R.R. Tolkien read their manuscripts and offered critiques of each others’ work. I sat where the waiter told me they sat, and I inhaled a lot, hoping to ingest some molecules. Later I wandered through Lewis’ house, looked out the window of his study, looked in the room where he slept. I wandered through the cemetery where Tolkien is buried. Maybe the molecule thing isn’t true at all. Maybe I know that this is not how greatness works. Each year I interview writers as part of The Writer’s Symposium By The Sea in front of a lively audience. Some of those writers, like Ray Bradbury and George Plimpton, are gone now. The New York Times, in its obituary on Bradbury, linked to my interview with him. You can see a lot of the interviews here. Sometimes, in the middle of the interview, my mind wanders and I get a little distracted by how lucky I am to be talking to someone who has helped us see that the world is much more interesting than we’d thought. That’s how I felt at Musso & Frank. The writers who hung out there made us pay attention to stories that were worth telling. The world is more interesting, sometimes more disturbing, but usually more understandable because they honed their craft and told great stories. Waiter! Check please? I have some stories to tell. 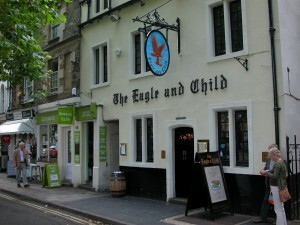 I was at the Eagle and Child a few years ago. One of the letters was missing from the name on the outside wall. I was shocked. I, like you, Dean, inhaled deeply when I went inside. I was hoping to take in some of Lewis’s and Tolkein’s lingering pipe smoke. All famous writers smoke, right? Many of them smoke at least something! Haha, that was awesome. Thanks!